The teachers at Learning Circle Preschool work very closely together and are all interested in fine-tuning our skills and approaches to enhance the curriculum in each classroom. You may not know that each week we meet as a whole staff for a few hours to share perspectives, bounce ideas off each other, and also to participate in more formal professional development on topics we’ve decided together would be beneficial. We have been thinking about the challenges of project development for a number of years now and improving our project development from this experience. This year we decided to participate together in an intensive course on emergent curriculum and projects, developed by Katrina and approved by the state so that ceu credit could be awarded. We talked together about some of the varieties of projects, embedding educational values, core standards and skill development in projects, challenges we all face as we try to implement projects, ways to organize projects and deeply engage children over time, sources of ideas for projects, and more. It was both exciting and engaging to come together around these important themes, and our invigorating conversations led to a renewed interest in emergent curriculum, and helped us begin to apply new knowledge in each classroom that we’ll continue to develop over time. Here are some samples of some of the diverse projects emerging around the school. Some are quite broad – like our on-going projects relating to story and storytelling. Some have a focused question or material under investigation, like the “water in motion” project that emerged from some children’s free exploration of water. In each case, project ideas came from our observations of the children’s investigations and interests. From observations, teachers develop materials, questions to discuss, or experiences to share together that we hope will stimulate a deeper level of engagement among the children. We document as we go along, and bring that documentation back to the children to stimulate more thinking about past experience as a guide to determining the next steps we may take together on the topic. This process continues until we bring the project to some closure through either presentation, discussion, or reflection. Starting from free use of open-ended shapes at the flannel board, teachers listened to the conversations and stories that emerged. They made sure to include a few shapes that implied “home and family” themes and it did not take long for stories to develop among the children about family, neighborhoods, invitations to a friend’s house, playdates, etc. 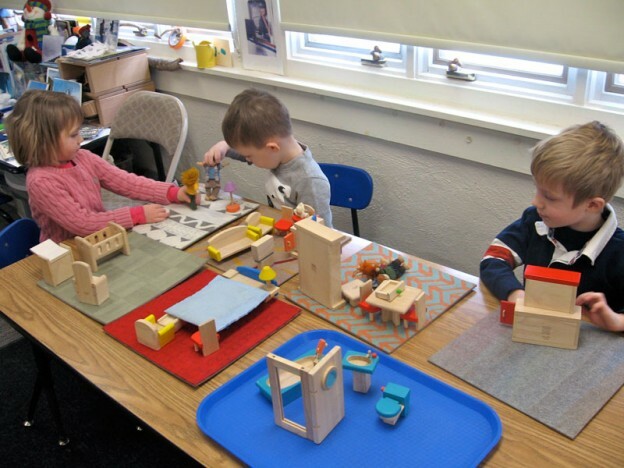 Knowing that children’s thinking often benefits from having materials to physically manipulate, the next step was to offer the children a set of doll house furniture to set up as conversations and stories continued. The teachers then made sure there were blank books available at the writing table, and many children have continued their themes as they create personal books. The current story project in the chickadee class is directly related to bookmaking experiences, puppetry and dramatic readings and retelling of folktales that the children have been engaged with since the fall in many different forms. We have included some formal book extensions like the one illustrated from Jan Brett’s The Mitten, reading together multiple times and giving children props with which to retell the story. With new children entering the class, the children spontaneously revisited a strong interest in their family photo albums, now increasingly interested in looking at and sharing conversations about experiences their classmate’s books. The newest element to our story project has been to introduce acting out short stories that the children create in the style of an approach first written about by Vivian Paley. In this storytelling experience, there are no illustrations. Children tell a teacher their story while the teacher writes their words. Then at a meeting the children choose characters and act out the stories. Through this process, the children develop their sense of story structure (beginnings/middles/ends), develop characters, and make sure there are actions for their characters to take. Can you find a way to get the water from the water table into the bucket that we put here on the floor? There were a variety of approaches used to solve this problem, and teachers took photos of the diverse techniques used. Them during a meeting, everyone looked at the photos together and the children were asked to talk about what they had discovered about moving water through tubes, talking about their experiments, what worked and what didn’t work so well. The children went back to the water after this discussion with new knowledge to try again, and after more investigation, drew their observations about how their experiments worked. This entry was posted in Curriculum, Education, Project and tagged curriculum, education, kindergarten, learning, preschool on March 28, 2015 by Katrina Selawsky.